The delay in commissioning of power-generation units by two thermal projects coming up in the private sector has cost Punjab State Power Corporation Limited dear. Drawing the attention of the Union Government on the "alarming situation" of the drug menace in the state, Patiala MP and leader of the Aam Adami Parliamentary Group Dharamvir Gandhi has urged the Centre to take immediate steps to check cross-border smuggling of drugs. In a statement, he said the Punjab Government had been blaming the Centre for the flourishing drug trade in the state. The police today registered two FIRs against as many Block Development and Panchayat Officers (BDPOs) for alleged embezzlement of Mahatma Gandhi National Rural Employment Guarantee Act (MNREGA) scheme funds. Both Patran BDPO Malwinder Singh and his Samana counterpart Dinesh Vashisht have gone into hiding. Akal Takht Jathedar Giani Gurbachan Singh today said Simranjit Singh Mann, SAD-Amritsar president, and other radical groups were never given any clean chit for their alleged involvement in the violent clash on at the Golden Temple June 6. The Sikh high priests today held a meeting in Amritsar and the clash was one of the issues on their agenda. Urging the people to judge the SAD-BJP alliance on the basis of its performance rather than criticism by political opponents, Chief Minister Parkash Singh Badal here today claimed that there was no political agenda behind the sangat darshan programme. The pond at Sidhwan Khurd village near Jagraon continues to spew explosives with 15 more hand grenades recovered from the village pond today. These hand grenades were recovered by the members of the anti-sabotage team that has been searching for the explosives in the pond after the earlier recoveries of ammunition. Moga, June 15 The ongoing drive of the state police against the drug menace has its immediate fallout on addicts in the district. They are feeling helpless due to the alleged insensitive attitude of the Punjab Government to rehabilitate them. Although the Centre has approved extending the National Highway No. 1 four-laning project from Ludhiana to Ferozepur, commuters continue to remain a harassed lot due to the appalling condition of this stretch. Work on the project remains suspended for unknown reasons. While the direct sowing of rice (DSR) technique is yet to catch the fancy of farmers in many districts of the state, paddy growers in the home district of Director, Agriculture Department, Mangal Singh Sandhu are setting an example in this field. According to officials of the Agriculture Department, around 20,000 acre land has been already brought under DSR since June 1. In a major relief to medical graduates seeking appointment as medical officers in Punjab, the Punjab and Haryana High Court has made it clear that the cut-off date for furnishing applications was not the last date for submitting online pleas, but the hard copies. In its drive against drug traffickers, the local police have traced a gang involved in drug trade in the district jail. The kingpin of the gang, identified as Manoj Kumar alias Mamu of Muktsar, was arrested by the Ropar police. Former Cabinet Minister Kushal Bahl (87) died following a cardiac arrest at his residence last night. His mortal remains were consigned to the flames at the Batala road cremation ground today. People from all walks of life, including politicians cutting across party lines, attended the cremation. Considered one of the tallest Congress leaders in Gurdaspur district, he is survived by three sons, Raman Bahl, Aman Bahl and Ajay Bahl. With Harsimrat Kaur Badal becoming the Minister of State for Food Processing in the "Modi Sarkar", fruit growers of this area are hopeful that the state-owned agro-juice plants based at Abohar and Hoshiarpur would be strengthened now. The plants were inaugurated jointly by Chief Minister Parkash Singh Badal and then Union Minister Subodh Kant Sahai in October 2007. Three teenagers, who had gone for a swim in the Gang canal near Hanumangarh Road in Sriganganagar last evening, have reportedly drowned. The district authorities have so far recovered two bodies. The police control room was informed at about 8 pm. Two of the victims have been identified as Kuldeep Meghwal, Paurush Batra of Suratgarh. Kuldeep’s motorcycle was spotted on a bridge near Sadhuwali. The management of Swami Vivekananda Drug De-addiction Centre has planned to set up a rehabilitation centre. It has submitted a proposal in this regard to Chief Minister Parkash Singh Badal at a meeting in Chandigarh recently. The de-addiction centre, functioning from the premises of Government Medical College, is one of the five model de-addiction centres announced by the state government a couple of years ago. To strengthen its fight against anti-national forces resorting to intrusion as also smuggling of contraband and counterfeit currency, the BSF has embarked on a project of erecting a new barbed wire fence in the Amritsar sector. Contrary to his party's stand that its leaders will not take security cover, Aam Aadmi Party (AAP) MP from Sangrur Bhagwant Mann has sought advice from his friends and supporters on whether he should take security for himself and his family. The District Employment Generation and Training Office is facing a staff crunch with 85 per cent of the posts lying vacant since September 30, 2013. A senior assistance and a clerk run the district-level office, where about 8,000 unemployed youths are registered. The office was set up on January 23, 1990. Deputy Chief Minister Sukhbir Singh Badal today credited his father and Chief Minister Parkash Singh Badal for everything in his life in response to his teenaged son Anantbir Badal's Facebook greetings to him on the Father's Day today. Extending wishes to his father in a post on his (Sukhbir's) Facebook page, Anantbir wrote: "You are the best dad in the world". Local residents have been living in fear as five youths, including a girl, have disappeared mysteriously over the last nine months. The police have failed to make headway in any of these cases. One of the affected families has been sitting on an indefinite dharna in front of the police station here while other residents have been holding protests, but to no avail. The Punjab Rice Millers Association has urged the Centre to review the "wrong" practices prevalent in the Food Corporation of India (FCI) for the past 50 years. The association said its similar pleas had evoked no response from the state government or the FCI. The Krantikari Pendu Mazdoor Union has asked the state government to allot panchayat land reserved for SCs to them at Rs 10,000 per acre. They said the SCs were not able to pay more for the land. The district police have released a poster carrying photographs of three unidentified robbers who allegedly shot dead Gopi Singh, 50, a security guard of Malwa Gramin Bank at Khadial village, near Sunam, on June 13. DSP Dirba Sewa Singh Malhi said the photographs had been taken from the footage of the CCTV cameras installed at the bank branch. The hot weather did not stop thousands of people from visiting the mazaars (tombs) of Laila, Majnu in Binjaur village on the last day of a five-day annual fair. Pakistani nationals have also been attending the fair, but this time they couldn’t get their visas on time. The fair also attracted tourists from far-flung places in Haryana and Gujarat. The president of the local unit of Shiv Sena, Angrej Singh (40), died after being attacked with sharp-edged weapons allegedly by a rival family. His supporter Bobby was also injured in the attack when he tried to save him. Angrej, a resident of Guru Ka Khuh Mohalla, succumbed to his injuries at Guru Nanak Dev Hospital in Amritsar. The delay in commissioning of power-generation units by two thermal projects coming up in the private sector has cost Punjab State Power Corporation (PSPCL) Limited dear. 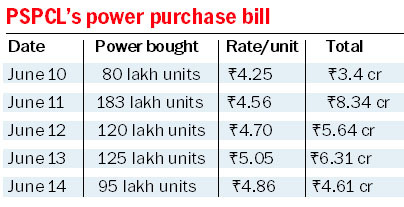 The utility has been forced to purchase power at comparatively higher rate to meet the state’s demand. Though the the two erring plants — Talwandi Sabo and Goindwal Sahib projects — have been slapped a penalty of around Rs 1,090 crore for the delay, the PSPCL is yet to recover the amount. While these two projects have been spared the stick, the PSPCL had adopted an allegedly different yardstick against the Rajpura Thermal project. Also set up by a private firm, Larsen & Toubro, the PSPCL had recovered Rs 10 crore from the firm for a mere 15-day delay. The plant had failed to commission its first unit of 700 MW by January 17 this year. The power purchase agreement signed by the PSPCL with private sector parties executing these plants clearly states that the companies would be liable to pay liquidated damages for any delay in the commissioning of their units. If the liquidated damage charges are not paid by the company, the PSPCL can recover the amount by invoking their bank guarantee. In case of the 1,980 MW (three units of 660 MW each) Talwandi Sabo project, being set up by Sterlite Group, the damage charges come out to around Rs 951 crore. All the three units of this plant have been delayed by more than a year and the penalty for each unit is Rs 317 crore, said sources. While the scheduled commissioning of the first unit had to be done by August 31, 2012, the second and the third units were to be commissioned by December 31, 2012, and April 30 this year. 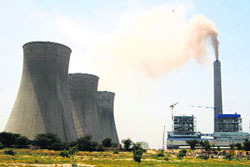 In case of the 540-MW (two units of 270 MW each) Goindwal Sahib project, the first unit was scheduled to be commissioned by May 2013 and the second unit by November 2013. Sources said the operating firm, GVK, has failed to commission any of the units till date. The damages (as per the contract) work out to around Rs 139.7 crore (as on May 30). However, the PSPCL has not recovered any amount from the company. Punjab has been purchasing 1,000-MW power (240 lakh units) daily on a short-term basis. It costs the state around Rs 8.5 crore, the rates varying from Rs 3.35 to Rs 3.75 per unit. A senior PSPCL official said “he could not understand the logic behind the PSPCL not recovering the due penalty”. He said besides this direct loss, the PSPCL was suffering on account of costly power being purchased on a short-term basis. PSPCL Director (Commercial) Surinder Pall said “he could only comment on the issue after examining the files pertaining to the matter on Monday”. He said after the recent Lok Sabha election, the state government had launched an anti-drug drive and arrested hundreds of youths, who were victims of the drug menace in Punjab. "This was no way to tackle this problem. Since this desperate attempt is being made in the aftermath of the election, I have every reason to doubt the sincerity and seriousness of the government to contain the problem," said Dr Gandhi. "Approaching this problem with a narrow framework of electoral gains or losses is not justified. This step of the government can never succeed. Unless the youth are given useful employment after a proper de-addiction drive, the problem is here to stay," he said. "In my opinion, it is in the public domain now as to how our state fell a victim to the conspiracy and evil designs of certain political forces in the 1980s and 1990s and suffered grave losses both in terms of human life and economic derailment. Both terrorism and war against it were foisted upon the people of Punjab by these political forces resulting in the death and misery of thousands of people," he said. The Patiala MP said: "During all these years of turmoil, our state got heavily indebted and is still paying huge instalments every year to the Centre. I urge the Central Government to write off all debts against Punjab and stop punishing the people of the state for no faults of theirs". Dr Gandhi was on Sunday admitted to Patiala Heart Hospital after he complained of chest pain. The Patiala MP’s wife said Dr Gandhi complained of chest pain in the morning and when it did not subdue, they rushed him to the hospital. "There was a minor blockage in one of his arteries and a stent has been placed to clear the same. He is responding well to the treatment," she said. Following his ill health, Dr Gandhi could not attend a function organised by Patiala residents to felicitate him. The duo allegedly bypassed village panchayats and even the technical wing of the Rural Development Department to carry out purchases. Payments worth lakhs were allegedly shown made even though material was not received. The estimated embezzlement is over Rs 1 crore. District Development and Panchayat Officer (DDPO) JS Sandhu had asked the police to register an FIR against the BDPOs, whom the inquiry had found guilty of lapses in purchase of material and utilisation of funds. The DDPO forwarded the complaint to the SSP office on May 31 but the police reportedly delayed registering of the cases. The BDPOs allegedly bypassed the elected representatives of all village panchayats to purchase the materials. According to norms, a village panchayat has to pass a resolution for development works, then the panchayat secretary forwards it to the junior engineer to make an estimate and the final nod is given by the department. However, the BDPOs bypassed all these rules. The inquiry summed up that the duo made payments to brick-kiln owners and manufacturers of water tankers, though the material never reached the department. Neither the quotations were invited nor were elected representatives involved in the purchases, and items were purchased at prices way above the market rates. After the issue was highlighted in the media, the police have finally registered cases against them under Section 419, 420, 467, 468, 120-B of the Indian Penal Code. The Jathedar said it was against the ‘maryada’ (religious ethics) to allow any political leader to make an address from the Akal Takht. “No politician can use the highest temporal seat as a dais to instigate or gain any vested mileage,” he said. The clash had reportedly occurred after members of Sikh radical outfits demanded that Mann be allowed to speak at a function organised to mark the 30th anniversary of Operation Bluestar. "It was improper on the part of radical groups to raise anti-national slogans during the function. When Mann was told to pacify his supporters, he tried to address the gathering and demanded a microphone,” he said. The high priests also discussed issues pertaining to the transportation of Guru Granth Sahib overseas. They have sought suggestions from the community about the appropriate mode of transportation. The Takht also directed gurdwara committees to install CCTV cameras and depute at least two attendants round the clock in shrines to avoid damage to the holy book in case of fire. The high priests declared Harminder Singh Khalsa ‘tankhaiya’ (guilty of religious misconduct) for indulging in objectionable activity at a Bangalore gurdwara. Calling it a “unique initiative”, Badal, who met the residents of seven villages, claimed the Sangat Darshan had been started to provide governance to the people at their doorstep. “There is no political motive. The event is solely based on the principle that for the creation of a healthy society, it is essential that all three components of the society — public, elected representatives and bureaucracy — sit together and work in unison,” he said. Badal said all collective and demand-based decisions taken during the Sangat Darshan would be displayed on boards in respective villages. After receiving some complaints during the programme, Badal directed the local administration to immediately conduct a survey for allotting houses to the poor families, besides financial assistance for house repair to some of them. Following the recovery of hand grenades, the police called bomb disposal squad from Jalandhar, which defused all the hand grenades. This is the fifth major recovery of explosives from the village pond during the last 10 days. On Saturday, the members of the anti-sabotage team had recovered one hand grenade, three detonators and 15 live cartridges of AK-47 rifle. Prior to that, around 8-kg RDX, 560 detonators, five hand grenades, four empty magazines and more than 100 live cartridges were recovered from the pond on June 12. On June 10, 11 hand grenades and 115 cartridges were recovered in the same pond while 14 hand grenades and 33 cartridges were found from there on June 4 during the cleaning of the pond. Following the second recovery of ammunition on June 10, the anti-sabotage team of the police had launched a massive search operation in the pond. They recovered around 8 kg RDX, 563 detonators, 46 hand grenades, more than 850 live cartridges and four empty magazines. The search operation in the pond still continues and the possibility of recovery of more explosives in the coming days could not be denied. The recovery of large scale explosives from the village pond during the last few days has the alarm bells ringing in the police department and security agencies. The police have been working on different theories to establish the actual source of these explosives. One theory that the police have been working on is that these explosives might have hidden by some terrorists. SSP Ravcharan Singh said the police have already launched an investigation to establish how these explosives reached the pond. The ongoing drive of the state police against the drug menace has its immediate fallout on addicts in the district. They are feeling helpless due to the alleged insensitive attitude of the Punjab Government to rehabilitate them. Since there is no government rehabilitation centre in the district, families of drug addicts often turn to private institutions. There are reportedly five unauthorised private rehabilitation centres functioning in the district. These unauthorised centres charge Rs 50,000 to Rs 75,000 for six months for a patient. It has also been observed that addicts are usually averse to getting treatment at private centres since those who are admitted there are not allowed to leave on their own. The private centres often resort to physical abuse, solitary confinement and other indignities to treat drug addiction. Recently, 20 youths fled from a de-addiction centre at Charik village after they were reportedly tortured. In another case, the local police had booked six persons for allegedly torturing and confining a youth at an unauthorised drug de-addiction centre at Khosa Pando village in February 2011. A similar tale of torture rocked the state in June 2010 when the district administration freed 25 youths from the illegal confinement of an unauthorised rehabilitation centre at Ghal Kalan village. However in all these cases, the district and police administration failed to take any action against owners of the rehabilitation centres reportedly due to political pressure. Though there is a de-addiction centre in the district hospital here, it runs only OPD services. Another centre run by the Red Cross Society at Janer village has the capacity to admit just 15 patients. Psychiatrists from the district hospital visit this centre twice a week. The Red Cross claims to have treated more than 400 addicts, but there are no follow-up reports to know whether the patients have shunned the drugs entirely. The Punjab and Haryana High Court has appointed a court commission to monitor the working of this rehabilitation centre and also directed the state government to upgrade it to 50 beds. The Red Cross collected more than Rs 20 lakh from local donors to upgrade this centre. Earlier, the four-laning was to be done from Ludhiana to Talwandi Bhai. The decision to extend the project was taken by Union Minister Nitin Gadkari after Chief Minister Parkash Singh Badal took up the matter with him last week. However, no deadline has been set for completing the project. The situation is bad at places where the work has been suspended midway. Things become more complicated during the rainy season. Initially, an amount of Rs 479 crores was approved for the project from Ludhiana to Talwandi Bhai, which was to be executed on the BOT basis. Residents of this border town had been demanding extension of the project up to Ferozepur and Hussainiwala. Keeping in view the historical importance of Hussainiwala, where the National Martyrs Memorial is situated, the ministry agreed to extend the project up to Hussainiwala. An additional amount of Rs 25 crores was to be spent on the extension. The Talwandi Bhai-Ferozepur portion was, however, ignored, much to the dismay of Ferozepur residents. He demanded that the work on the stretch should be started at the earliest. He also demanded that the stretch between Ferozepur and Hussaniwala should be completed at the earliest. "Thousands of people visit Hussainiwala to pay respects to the martyrs and watch the India-Pakistan retreat ceremony every day. Several big festivals like Baisakhi and Shahidi Divas are also held here during which lakhs of people come here. So, the project should be taken up on priority by the state government and the Centre," he said. Things become very difficult during the rainy season. The district ranked first in the state by bringing around 25,000 acres under DSR last year. This year, the department has fixed a target of bringing 60,000 acres under DSR. The technique not only saves water, but also increases yield up to 10 per cent, besides lowering the cost of transplantation as it requires fewer labourers. Beant Singh, Chief Agriculture Officer, Muktsar, who is also a progressive farmer, said, "We had only 100 acres under DSR three years ago. However, efforts of our team and the initiative taken by farmers helped us create a record in the state. This year also, we are set to create another record surpassing the previous one." He added, "The district has around 110 machines for the direct sowing of rice that are being used day and night. Farmers are vying hard with each other to hire DSR machines." "We are making DSR machines available to farmers for Rs 20 per hour, while cooperative societies are charging Rs 50 for each hour, but without fuel and driver. The machine transplants paddy in an acre in around 30 minutes," he said. "Private machine owners are providing it by charging Rs 600 per acre, which also includes a tractor, wages of driver and fuel expenses," he added. 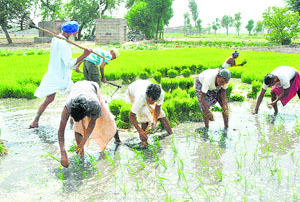 On the other hand, labourers charge around Rs 3,000 per acre to transplant paddy as per the traditional method. "The traditional method is not much useful. Experts say 33 plants should be transplanted in every square metre, but labourers transplant only 18-20 plants in that much area, which hits yield," Beant Singh said. "Moreover, the department provides a subsidy of Rs 20,000 to every farmer for buying a DSR machine, which costs around Rs 60,000," he added. "After coming to know about the increasing demand of machines, we have sought assistance from the cooperative societies, appealing them to buy some more machines so that farmers can benefit," said Vipul Ujjwal, Additional Deputy Commissioner, Muktsar. 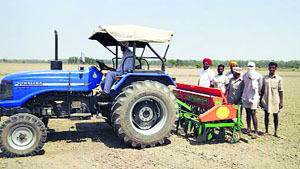 The Agriculture Department has also experimented with zero-tillage technique on 35 acres of Kulwinder Singh of Kotli Sanghar village. "Zero-tillage means there is no activity on the field, the moisture level present in the soil is maintained and seeds of new crop germinate with the help of the ambient moisture in the soil," said Beant Singh, Chief Agriculture Officer, Muktsar. Justice Rajesh Bindal also directed that the candidates, who submitted requisite documents before the expiry of the last date for submitting hard copies of the applications, should be treated eligible. In all, 334 posts of medical officers were advertised. In their case, the last date for submitting applications online was January 11, 2013, while the hard copies of the application could be submitted till January 21, 2013. The orders on the petition filed by Ankush Goyal and other petitioners is significant as their counsel had been insisting that the date fixed for submitting hard copies of applications should be taken as the cut-off date for considering eligibility conditions, and not the date up to which the applications were to be submitted online. Their counsel Vipul Jindal argued that a candidate submitting an application online, but failing to furnish hard copy of the documents, was to be treated ineligible. As such, a candidate was considered eligible only if the hard copy of the application, along with all supporting documents, were submitted. Justifying the delay, Jindal had contended that internship after MBBS came to end a few days before the cut-off date. It took some time to get the internship completion certificate and the degree. Disagreeing, the state counsel contended that hard copy was only a printout of the application submitted online, along with supporting documents and receipt for deposit of fee. Justice Bindal asserted: "The issue sought to be raised by counsel for the petitioners is that the cut-off date in the present case should be taken as January 21, 2013, the date up to which hard copy of the application, along with the requisite documents, was to be submitted. In my opinion, the contention is meritorious if considered vis-à-vis the requirements, as mentioned in the advertisement…. "In my opinion, the candidates who had submitted all requisite documents along with hard copy of the application up to January 21, 2013, should be treated eligible and their candidature be considered for appointment, in case they are found to be in merit on the basis of the screening test and other criteria laid down for selection." His accomplices Manish Kumar and Sukhwinder Singh, both of Ferozepur, and driver Jasbir Singh, were also arrested. The police seized 580 gm of intoxicants, two cars and a motor cycle from their possession. VP Singh, Senior Superintendent of Police, Ropar, said Mamu was lodged in Nabha jail. His driver and other aides, who were in constant touch with him, had been taking instructions from Mamu regarding procurement and delivery of drugs. The gang had its network spread in Jalandhar, Ferozepur and Muktsar, he added. Fatehgarh Sahib: The district police have arrested four persons and seized 5 kg opium, 270 gm of narcotic powder, .315 bore pistol and 15 live cartridges from Sirhind town today. Gurmeet Singh Chauhan, Senior Superintendent of Police, said the police had put up a naka near Dussehra ground in Sirhind. During a search, the police arrested Prithvi Raj of Bikaner and seized 5 kg of opium from him. The police also arrested Balkarn Singh of Baraichan village, Sukhdev Singh of Sikandarpur and Balwant Singh of Sirsa in Haryana and seized 270 gm of narcotic powder, .315 bore pistol and 15 live cartridges from them. Kushal Bahl started his political career as a student leader in Lahore and later joined the Congress. He was the president of the Gurdaspur Municipal Committee before being elected an MLA in 1972. He remained an MLA from Gurdaspur for four terms. He also served as a minister under Chief Ministers Giani Zail Singh, Beant Singh, Harcharan Brar and Capt Amarinder Singh. He held the portfolios of medical education, industrial training, jails, labour and employment, higher education and school education. Kushal Bahl quit active politics in 2007. During the 2012 Assembly elections, his son Raman Bahl contested on the Congress ticket, though unsuccessfully. He also remained associated with various philanthropic bodies and was the founder Chairman of the Gurdaspur Education Society. Chief Minister Parkash Singh Badal, Deputy Chief Minister Sukhbir Badal, Leader of Opposition Sunil Jakhar, Public Relations Minister Bikram Majithia, Punjab Congress chief Partap Bajwa and other leaders of the region have offered their condolences to the bereaved family. The processing of fruits and vegetables was restarted at these plants in December last year after their lacklustre performance over the past 5 years. The plant at Abohar took up processing of 2,500 tonnes of kinnow for Hindustan Lever Limited (HLL). Cremica and PM Enterprises signed contracts for the processing of 7,500 tonnes of tomatoes at Abohar and Hoshiarpur plants each. "We finished the job by arranging tomatoes from different areas of Punjab and Haryana on May 15," said PM Enterprises executive officer Mahesh Bhalotia. Punjab Agro Managing Director KS Pannu recently said chillies, guava, mango, galgal and black carrot would also be processed at these plants. This would promote fruit and vegetable cultivation in the state. The processing of kinnow and carrot would also be taken up for preparation of food concentrates, he added. Chief Minister Parkash Singh Badal sanctioned Rs 2 crore for upgrading the plants last year. That facilitated replacing of some worn-out boilers. SAD women wing district president and progressive farmer Nirmala Bishnoi yesterday met Harsimrat Kaur at latter's residence to discuss upgrading of the Abohar plant. She told the minister that the plants at Abohar and Hoshiarpur, which were the only such units in the public sector in India, needed to be modernised. Kuldeep is Forest Department Ranger Prithvi Raj Meghwal’s son, while Paurush had arrived here to spend his vacation. The third boy may have been Paurush’s friend. Deputy Superintendent of Police (DSP) Rajinder Dhidharia said Birbal, who was also swimming in the canal at the time, informed the police, when he found that the boys had gone missing. Irrigation staff at Sulemanki, Netewala and Faquirwali headworks was told to keep a vigil. The civil defence divers fished out the bodies of Kuldeep and Paurush near Netewala headworks. Their postmortem would be conducted at the civil hospital on Monday, sources said. Meanwhile, the body of Naresh Kumar (40) of Bapunagar (Sriganganagar) has been found in the sub-canal near 4BBA village. He had gone missing on Tuesday. The body of Pawan Khunger (45) of Malout has also been recovered near the Shivpur headworks of Gang Canal on Abohar-Hindumalkot road. Pawan had been missing since June 11. His footwear was found on the banks of the canal near Cooperative Sugar Mills on Abohar-Fazilka road. The management of Swami Vivekananda Drug De-addiction Centre has planned to set up a rehabilitation centre. It has submitted a proposal in this regard to Chief Minister Parkash Singh Badal at a meeting in Chandigarh recently. The de-addiction centre, functioning from the premises of Government Medical College, is one of the five model de-addiction centres announced by the state government a couple of years ago. Among other districts where these centres were planned are Patiala, Bathinda, Faridkot and Jalandhar. But barring the Amritsar centre, the remaining are yet to come up. After their treatment at the de-addiction centre, the patients will be admitted to the rehabilitation centre. This facility will be for those patients who were hooked to drugs for a long time. "An addict is usually detoxified in 15 days. But there are chances of relapsing. This rehabilitation centre will help in longer stay of patients for up to three to six months depending upon the severity of the problem," said Dr PD Garg, Head, Psychiatry Department, and Director, Swami Vivekananda Centre. "The rehabilitation centre will provide therapies such as psychological, social, behavioural and occupational, which will help patients in diminishing their craving for drugs. This will also help in rehabilitating the addicts in the mainstream in a better way. We also contemplate to hold workshops to help patients acquire professional skills," Dr Garg said. Talking to The Tribune, MF Farooqui, BSF, DIG, confirmed they had taken up the project on a stretch of 33.11 km and the work had already been kicked off. He said the barbed wire fence was last erected around 15 to 20 years ago. "Over the years the fence has worn out in some stretches which poses a serious security threat. We have also prioritised the areas depending upon the damage and new barbed wire fence will be first erected in the stretches which are more vulnerable to intrusion or smuggling threats," he said. He said the new barbed wire fence would be of the existing height. He, however, said they had sent a proposal in the past to further raise its width as well as height. The DIG said the work of replacing the fence was underway in border villages such as Roranwala, Pul Moran, Udhar Dhaliwal, and Mahwa. He said the proposal to erect the new barbed wire fencing was first put up in 2011. 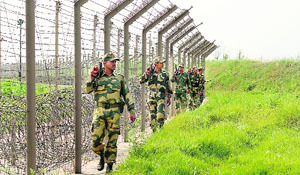 Though there is no set deadline, the BSF hopes to complete the project soon. Mann has posted this query on his Facebook page. Earlier, Mann had categorically said he would not seek any security. Mann said he had received a huge response on the matter and most of the people had asked him to accept security while some had suggested him to arrange private guards. He said he was yet to take a decision on the matter. The Sangrur MP said Deputy Chief Minister Sukhbir Badal should also ask the people whether he (Sukhbir) required "such a large number of security personnel". As per norms, an MP is given four personal security officers. Mandeep Singh Sidhu, Senior Superintendent of Police, Sangrur, said though there was no threat to Mann, he must take security as per norms. "If the MP gives us in writing that he does not want security cover, I will inform the police headquarters," he said. He said since Mann did not want security, two policemen were still provided to him, but the MP had not been taking them along. Though the state government has implemented Right to Service Act, the office has failed to provide the requisite services due to staff shortage. 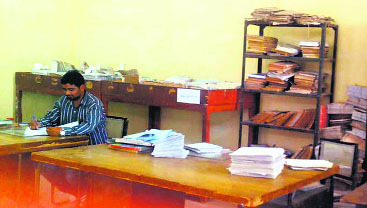 Sources said of the 15 sanctioned posts, 13 posts, including that of District Employment Officer, Employment Officer, Vocational Guidance Officer, Statistical Assistants, superintendents, clerks, peons and sweepers have been lying vacant since the office became a district-level office on September 30, 2013. In the absence of a district head, the employees have to go to Moga, nearly 150 km away, to carry out official and financial work. The Drawing and Disbursing powers of Fazilka office have been allotted to District Employment Generation and Training Officer in Moga. “We face a lot of inconvenience due to the acute staff shortage in the office,” said the employees. Within seconds an apparently elated Sukhbir replied: "Anantbir today woke me up saying 'Happy Father's Day' and gave me a big hug. He said you are the best dad in the world. My immediate response was best dad taan daadu ne (the best father is your grandfather Parkash Singh Badal)". He wrote that every child thought his dad to be the best. "But my father is the greatest. He is an amazing mix of compassion, patience, care and wisdom. And the best part is that he is the same with others as well. He treats everyone as his own child. I am grateful to 'Waheguru' to have born to him". At least 3,554 Sukhbir followers liked his comments and 356 commented on his post till the evening. One of the followers, however, commented that Sukhbir should have at least used the Punjabi language to express his feelings for his father. A 24-year-old youth, Manoj Kumar, working as an automated teller machine (ATM) loader, went missing from his house on May 25. Alleging that the youth had been kidnapped, his family has been staging a protest outside the police station. Four months ago, a teenaged girl of Bazigar Basti had gone missing. Harshit Sharma (17), a mechanical engineering student in Solan (HP) and his cousin Adarsh (14) went missing on October 17 last year a day after Harshit reached Faridkot to meet his maternal uncle at the BSF campus. Both belonged to Himachal. A few days prior to that, an engineering student, Kulwinder of Qila Nau village in Faridkot, had went missing. "We have constituted special investigating teams and are trying our best to solve these cases," said SS Kahlon, Faridkot SSP. Press secretary of the association Nakesh Jindal has urged Prime Minister Narendra Modi to review functioning of the FCI in the national interest. He said the FCI had established a laboratory as the final authority for sample testing, leaving aside the Lab of Director Food, Punjab. The association had to move the Punjab and Haryana High Court with an appeal for allowing an authority where the findings of the FCI laboratory could be countered. Due to the paucity of staff and space crunch faced by the FCI, the rice industry had to suffer losses during the financial year 2012-13. On the other hand, the state government charged three-month interest from them from April 1, 2013, resulting in closure of hundreds of rice shellers. Jindal said the state government should utilise leftover gunny bags lying with the millers pertaining to financial year 2013-14, instead of fresh purchase of gunny bags for the 2014-15 crop, so that rice shellers could survive. The Scheduled Caste community has been protesting in Baopur, Namol, Balad Kalan and Matoi villages, demanding that they be allotted the land at low rates. The auctions in these villages have already been cancelled twice. State union president Sanjiv Mintoo said the state government had in 2008 reduced the rate of nine acres of panchayat land reserved for SCs in Benra village. He said the auction rate had been reduced from Rs 2.75 lakh to Rs 1.05 lakh. He said the government should reduce land rates for the welfare of the SCs. The auctions in these villages have already been cancelled twice. The poster announced that the name of the person giving information about the robbers will be kept secret and he will be rewarded suitably. Anybody having information about them can contact Dirba DSP on phone number 80545-45009; Sunam DSP on phone number 80545-45008; Sangrur DSP (D) on phone number 80545-45013; Chhajli SHO on phone number 80545-45118; and Sunam SHO (City) on phone number 80545-45114. Gopi Singh, an ex-serviceman, was on duty when three persons came there on a motorcycle and opened fire on him. Gopi Singh succumbed to his injuries. He was a resident of Bhattiwal Kalan village, near Bhawanigarh. Though historians say Laila and Majnu were mythical characters, people believe a couple’s wishes come true if they visit the tombs. The Border Security Force (BSF), guarding the international border in the Anoopgarh sector nearby, has named two of the border outposts as Laila and Majnu. People waited in long serpentine queues to offer “chaddar” at the tombs. Pritam Singh, president of the managing committee, thanked the state government for building an inn for visitors from far-flung areas. Scores of stalls offering snacks, sweets, and fresh lassi had been set up in the area. 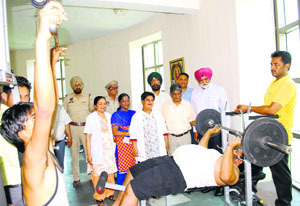 Wrestlers, kabaddi and volleyball players from distant towns and villages enthralled the visitors. Artistes from Malerkotla and Uttar Pradesh sang qawwalis for the people. Today was the last day of the annual five-day fair. The police have booked six members of the rival family, Rajesh Kumar Bhallu, his father Kartar Chand, mother Manjit Kaur, brother Vicky, wife Simran Kaur and sister-in-law Suman. The victim's supporters protested at the local Civil Hospital when doctors there referred Angrej to Amritsar. They were booked for hooliganism as they removed the turban of Medical Officer Dr Kanwaljit Singh, who was on emergency duty. The victim's supporters had been demanding that Angrej be treated at the Tarn Taran Civil Hospital even as the doctors said that he needed to be shifted to Amritsar for advanced treatment in view of his serious condition.